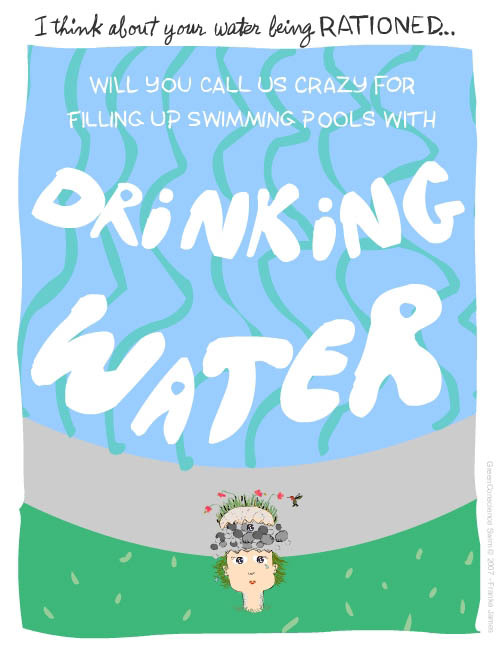 Will you call us crazy for filling up swimming pools with drinking water? “My Green Conscience” is an illustrated journal of my personal struggle to be green in North America. It is available as an RSS feed, and as a free widget. Just click on the ‘Get Widget’ button, in the sidebar to the right, to get the code for your site. The drought here in Australia has been really bad. We’ve been on high level water restrictions in the cities. No watering gardens (except by watering can on every odd day), no filling of swimming pools *at all* unless you have your own tank to do it with, and now the government is talking of using recycled sewerage for drinking water. As far as pools go, though, the swimming pool industry is pretty much dead in the ground – no one is putting them in, because you’re not allowed to fill them! In short, it’s bad. Really, really bad. The drought has broken now, and we’re getting rain, but a lot of people around here (I live in Melbourne, a city of 3 million people) are getting rid of any lawn areas they have, and putting in water-friendly gardens that require no watering, because we know that next summer could be as bad, if not worse. One of the biggest problems has been the bushfires as well. And a lot of the farming areas have simply turned to dust. I don’t know how Australia will cope into the next century – our farming is not looking good without water, and the other main industries (mining, especially coal, are not Green-friendly) and must close if humanity is to become sustainable. Thanks for the great blog that I really enjoy reading!